A woman snorkeling in a reef. The hiss of your breath flowing through your snorkel. The sight of a colorful fish darting from rock to rock on the sands beneath you. Amateur and professional snorkelers alike know the feeling, and Sanibel Island provides them with plenty of opportunities to experience it. The southern tip on a string of islands off the coast of southwest Florida, Sanibel is just undisturbed enough to allow for some fabulous snorkeling in state and city parks and just developed enough to provide first-timers with guided tours. Bowman's Beach, at 1700 Bowman's Beach Road in Sanibel, is all at once popular and remote. After a roughly five-minute walk from the parking area, you'll find the beach, a local favorite for many reasons, not least of which is its fabulous snorkeling opportunities. Open from 7 a.m. to 7 p.m., this beach is only a few miles from the man-made Belton Johnson's Reef, which is home to countless species of fish and other ocean wildlife, providing some spectacular snorkeling sights both at the reef -- a short trip by boat -- and just off the shore. The beach is also known for its many shells. In the waters beneath where a bridge to mainland Florida once stood, a teeming man-made reef has formed from the bridge's rubble. The wildlife population in this reef makes the waters of nearby Lighthouse Beach -- at the eastern side of the island on Periwinkle Way -- ideal for snorkeling. You'll have to pay a $2-per-hour parking fee, and you can't go inside the lighthouse, but the snorkeling amid myriad shells and fish is worth it. Causeway currents can make make swimming risky on some days, so check with beach authorities before you dive in. Cayo Costa State Park -- just north of Sanibel -- boasts more than nine miles of shoreline. The water is pristine and perfect for snorkeling -- due in part to the gently sloping sea bed, making it a good choice for beginners -- but the park is only accessible by boat or ferry. The park has some of the most untouched beaches in the area, making ocean life a more common sight, and the shelling is best on the southern tip of the island. The park, open from 8 a.m. to sundown, explicitly forbids disturbing any plants or animals and swimming outside designated areas. Anticipate a per-vehicle fee to enter the park. If you're just starting out or want the benefit of a guide, you can take a guided snorkeling tour with Captain Joe's Charter Tours, on Brainard Bayou Road on Sanibel. 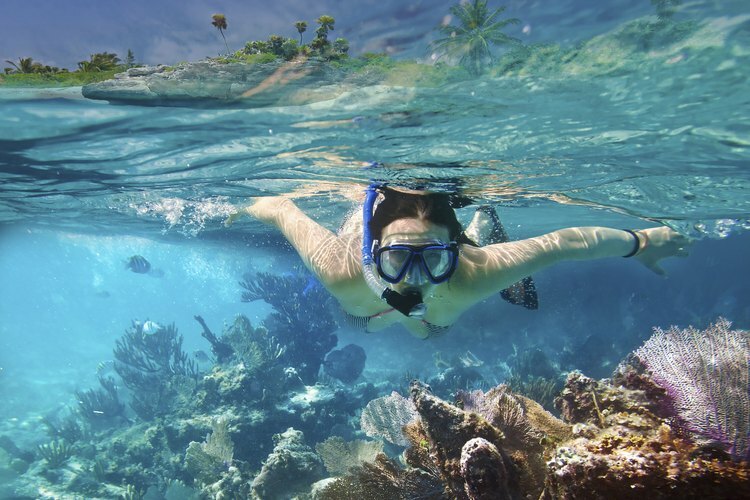 The tours take you to Cayo Costa to see the local fish and collect shells, and provide snorkeling equipment and a cooler for snacks with your tour. You can schedule a private group tour -- which includes up to six members in your party -- or a mixed group tour of up to six. Both tours usually last approximately three hours. You can make reservations by phone.